Those in the drug trafficking business have long tried to elude detection on trips north to America through the use of drug-filled homemade submarines, now, taking things one step further, cartels in Mexico are borrowing another page from national military playbooks by constructing homemade narco-tanks. 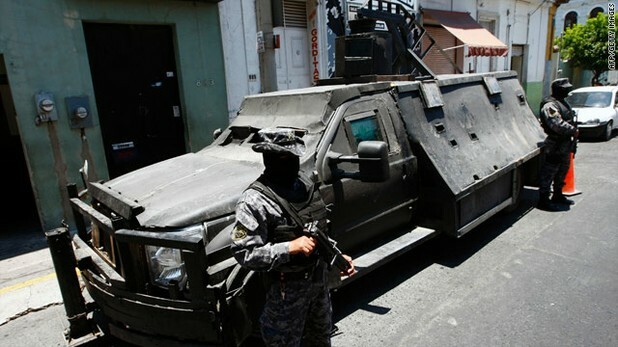 Mexican police in Mezquitic and groups from various drug cartels fought violently last Friday, and when as the battle drew to a close, police managed to capture a rather unusual vehicle from thecarte; soldiers. A homemade drug-tank - built on the frame of a Ford F-Series Super Duty pickup truck, the vehicle had been modified to include heavy gauge steel plating around most of the exterior (cut with gun ports for those inside), a retractable battering ram, and even a rotatable gun turret on top. This is the second drug-tank Mexican police officers have confiscated within a month, and reports indicate that cartels are increasingly constructing heavy duty ‘war vehicles’ for use in battles against local drug rivals, as well as the police and soldiers that pursue them. In other Mexican drug-war news, 500 rural villagers in Michoacán State have fled from their homes to take refuge in a shelter constructed in a local swimming park; fleeing the increasing violence between rival groups of the ‘La Familia’ drug cartel. According to the Norway based group, Internal Displacement Monitoring Centre, drug violence has forced 230 000 Mexicans to abandon their homes. Most move to stay with relatives, either in Mexico or in the US.